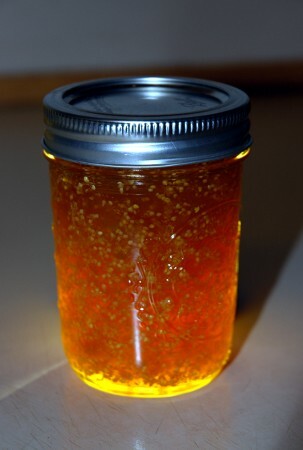 From jams and jellies to canned fruit, preserving in sugar (sucrose) is a common method of saving food. Robin has canned peaches and cherries before, but during the past week we’ve expanded into candied vegetables and jam. You can find the complete recipe here, so I’ll not repeat it. 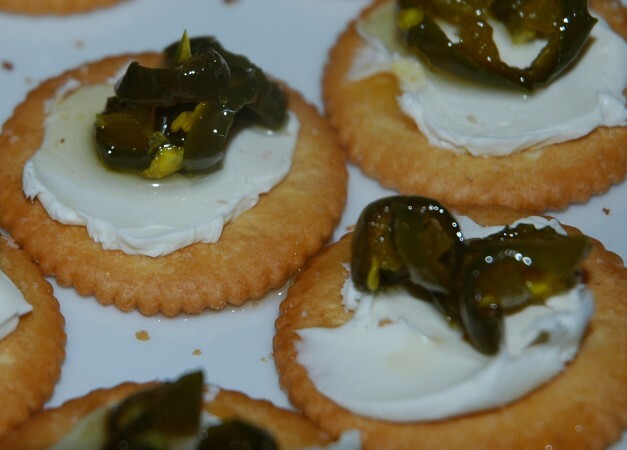 The recipe calls them “Cowboy Candy”, although “candied jalapeños” is more descriptive. Starting from 3 pounds of peppers, we ended up with 6 half-pint jars of candied peppers and 4 half-pints of left-over spicy glaze. Honestly. It’s amazing. These things pretty much redefine the term sweet and spicy: great flavor, sweet on the tongue, and then a burst of flame to light up your mouth. We’ve mostly eaten them with cream cheese on crackers, but they are great on taco salad, and lots of other things too. Just looking at that picture makes me hungry again. The recipe suggests waiting two weeks before you open a jar, but after giving away 3 jars we are going to have to start another batch right now if we want any to last that long! Ground cherries are an odd plant. As member of the Physalis genus, they are related to tomatillos and Cape Gooseberries and can claim tomatoes as a slightly more distant relative. The fruit falls from the plant when ripe, wrapped in a papery husk. 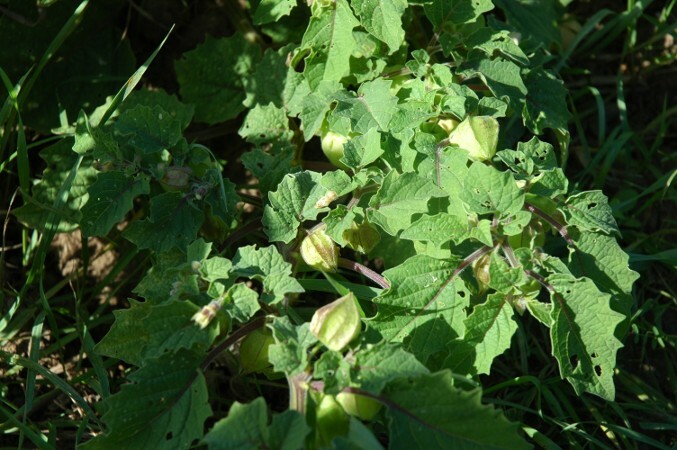 The unripe fruit and plant stems and leaves are deadly poisonous (Nightshade family). Common varietal names are “Pineapple” and “Aunt Molly”. Our plant is a Pineapple, but I’m going to grow several of both next year. On my previous post about ground cherries, Leigh asked if we’d tried making jam. Well, no, but after reading about it here I was keen to give it a try. I settled on this recipe, which seems to be the most common one online. In a pot, bring 1 cup of sugar and 1/8th cup of water to a boil and simmer for 2 minutes. I thought this ratio would burn easily, but instead it produces translucent bubbles. 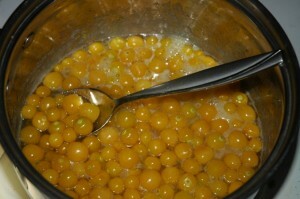 Add the ground cherries and lemon and return to a boil. 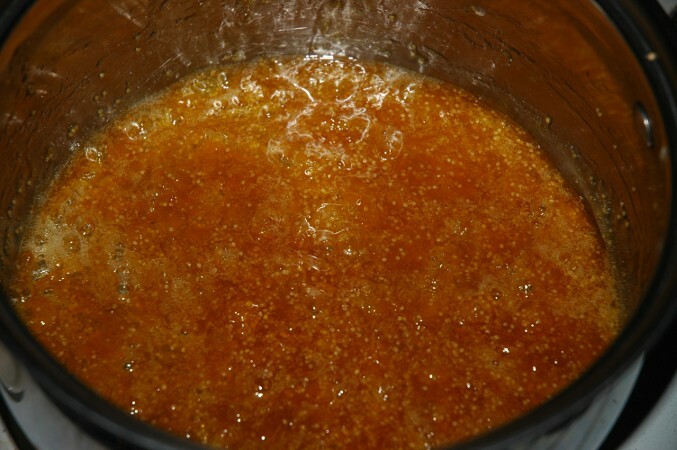 Simmer for 5 minutes. Some of the cherries will burst from the heat. 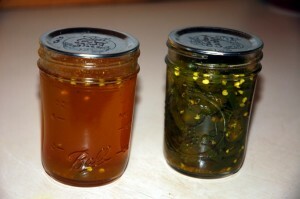 Remove from the heat, cover, and store in the fridge. 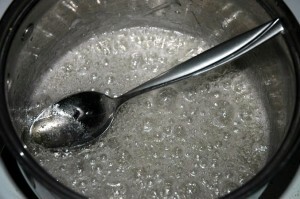 The next day, bring the mixture back to a boil and simmer for 15 minutes. The remaining cherries will burst and the mixture thicken. Pour into a clean half-pint jar and immediately invert for 5 minutes. After turning it back right side up, the jar popped with a seal in about 10 minutes. Meanwhile Robin and I cleaned out the cook pot. The flavor was mild, a blend of citrus and ground cherry tones. We’ve decided that turning ground cherries into jam is much better than eating them fresh. This entry was posted in Gardening, Skillset. Bookmark the permalink. The canned peppers sound good, but the canned ground cherry jam look absolutely beautiful! I love the color! When you get all your canning done, please take picture of all the colorful jars together so we can see. Thanks! I’ll admit I cheated a little in the last picture and threw a flashlight behind it to bring out the color. The camera flash just doesn’t do it justice. It occurs to me now that strong sunlight would have worked well too. Ah, yeah, all the jars are pretty, but our shelving is not! 🙂 Perhaps I can get a picture after we can the last of our salsa. Thank you so much for this. 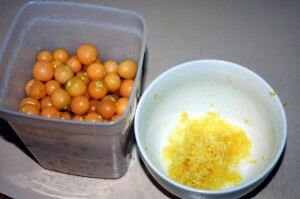 I’m thinking about trying some ground cherries next year and always appreciate the experiences and opinions of others. Good photo description of the jam making process. The dehydration idea sounds like one to try as well. I have been tempted to grow ground cherries but had never seen or tasted them so didn’t want to waste the space if they weren’t good. Thanks for posting this, I will try one next year. I have a recipe from my grandma that is crazy-good. 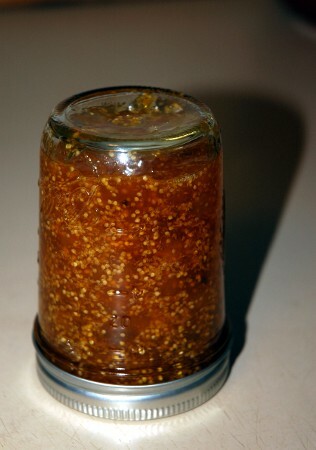 It is a jam made from canned pineapple and jalapeno peppers. It’s tangy and sweet and hot, all at the same time. I think I’ll make some now that you have reminded me. Thanx! Leigh – We bought the one plant on a whim, but it’s been kind of fun to try out something new. I’m still not sure I really like the flavor of them fresh (thus my plan to try the other variety next year), but it’s such an interesting plant. The jam is very good though. Regarding the candied hot peppers, I would assume that any pepper of similar spice should still work in the recipe. Robin has some Habanero peppers in the garden still that we will probably candy as well. 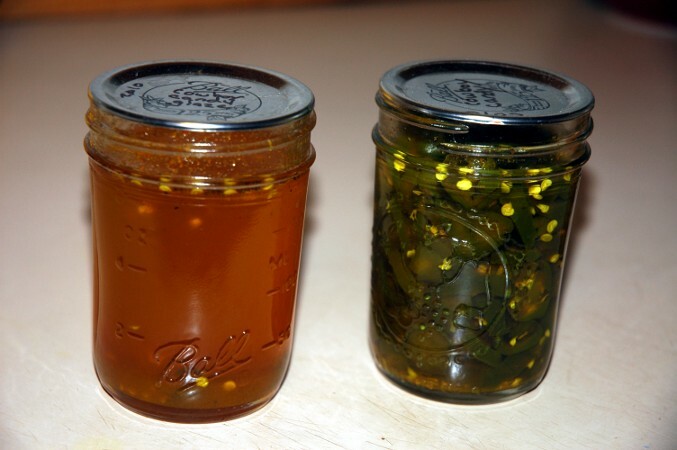 Lauren – My mom used to make jalapeno pepper jam. Your version with pineapple sounds like it has a lot of the same qualities as this Cowboy Candy.